This photograph is gory, but does do an excellent job of illustrating the "conveyor belt" egg production process. Photo and information from Keith Kridler. 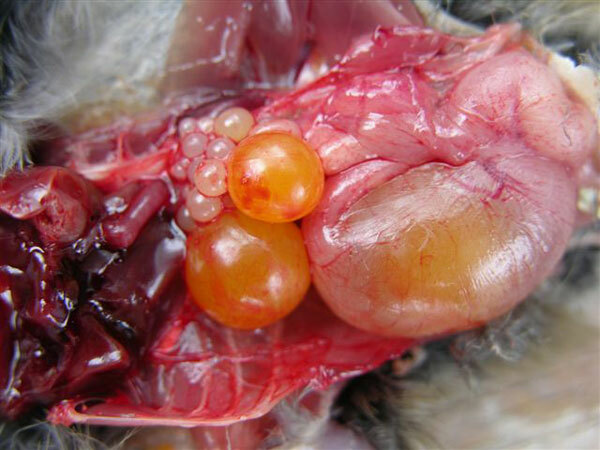 Ovulation: the egg is released by the ovary into the oviduct. This usually happens every 24 hours. Fertilization: In the infundibulum (the first section of the oviduct) the egg is fertilized by male sperm. This has to happen before the egg white is added, because sperm can't get past the egg white. In Downy Woodpeckers, the egg is only in the infundibulum for about 20-30 minutes. Albumen Added: the egg moves down the oviduct and into the magnum where the albumen is deposited. Egg is laid: Usually one a day (sometimes skipping a day) until the clutch is complete. unhatched eggs.htm">Why didn't the eggs hatch? The FIRST bluebird eggs I saw were when my father lifted me up and held me in his arms so that I could see down into the nest. Five delicate, sky blue eggs nestled in a beautifully woven grass nest! That chance nesting of the bluebirds in our nestbox helped to encourage a lifetime of memories!